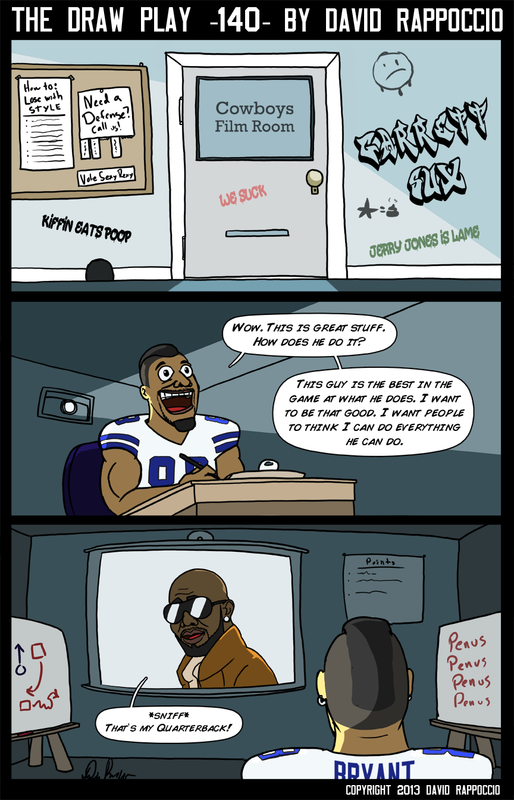 Figures right as I’m finishing this comic up the NFL releases the audio from the game that shows Dez was just talking strategy with Romo and not yelling at him like a “spoiled child”. Thanks for making my joke wrong, jerks. Now I look like the jerk. Oh well, I was going to defend Dez anyway. Sort of. This is one of those “Dave doesn’t actually agree with the joke in his own comic but made it anyway cause he found it funny” comics. Funny, this seems to happen a lot with Cowboys comics. I just love me some Romo. Get off the Cowboys, Romo. They don’t deserve you. You are too cool for Cowboy school. But I digress. DEZ BRYANT IS A BABY DIVA DUMB BABY DORK. And that’s what makes him awesome. See, I hate Dez Bryant. I hate his big ol’ face. I hate his weird touchdown taunt. I hate how good he is and that he makes the Cowboys better when he isn’t being a dummy. I hate his mohawk. I hate his earings. I hate his stupid chin beard. I hate his attitude. But…I love Dez bryant. I love to hate Dez bryant. I love hating on Dez Bryant. I love that the Cowboys are full of cool players like Ware, Witten, Romo, and Sean Lee that make me hate them less but then I remember Dez Bryant exists and I take extreme joy in watching his big ol’ stupid face lose a game and act like a baby. I love Dez Bryant because I hate him so much. Dez Bryant is good for the NFL. 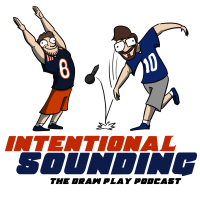 We need players like Dez Bryant, because Football is drama. Football is television. Football needs a big noisy antagonist. A villain. Not an actual bad guy like Aaron Hernandez but a flamboyant TV villain. We need those big personality players, because we need someone to hate. They form great contrasts to the quiet, dignified players (like Calvin Johnson). They are the Yang to the Yin. Watching T.O. clown my team for years on the Eagles and Cowboys made me sick, and it made me even more sick every time he showboated after a win. But then, when the Giants beat the Cowboys in 2007 and TO cried? It was like 5 christmases in a row. It was basically the superbowl. If the season had ended the next week I would have been happy, because we made TO cry. Of course that didn’t happen and then we made Tom Brady and Brett Favre cry so it’s all good. 2007 ruled. Sorry Brett. I liked you. Now TO, or Dez…they aren’t actually bad people (I assume) but they are big personalities, and hating on big personalities is just as fun as rooting for the “good” guys. We need players like Dez Bryant to counteract the robots Goodell wants. Bryant isn’t even that bad a guy. He’s just really passionate, as the video with him on the sidelines shows. (Notice they didn’t show the audio from the fight with Witten later, though). Bryant gives us those players to hate, those “bad guys” we like to see get it. Deion Sanders was one. Michael Irvin was one. Ray Lewis was one. Richard Sherman is one. Golden Tate seems like one. Hell, the entire Cowboys franchise is one. AMERICA’S TEAM RAH RAH RAH. Unless you are a Cowboys fan, you hate them (if you aren’t a cowboys fan and like the cowboys, then you are weird and wrong). The Cowboys are a big diva team. You love em or you hate em, but Divas are prominent, boisterous, and good for the game of football. especially when they lose. Man that’s always good stuff. What else do you expect from a franchise that is owned by one of the biggest divas in America, not just the NFL?! I’m thinking non-Dallas fans of the Cowboys have got to be some very strong masochists. You’d think even Jones’s marketing would’ve worn off by now. So does that mean you love Golden Tate too? I dont get the punchline, i think im missing something. I know its TO, but the “thats my quarterback” thing goes right over my head can someone explain? When the Giants beat the Cowboys in the playoffs in 2007, people started blaming Romo. T.O. cried during his press conference while defending him in the biggest display of hamming it up for the cameras anyone has ever seen. “That’s my quarterback” is the famous quote from that press conference. Youtube TO crying and you’ll get the video. Golden Tate is like our own Hines Ward, who I completely despised. Little guy that plays hard, but does countless A-hole things. Love how he plays, hate how he celebrates. I’m very torn. I have literally zero reason to dislike the Cowboys. My team of choice plays in the AFC. As an NFC East team, they are completely off my radar as a team to worry about. I didn’t even watch most of the Cowboys game on Sunday because (as a Broncos fan) the Chiefs/Browns tilt was far more relevant to my interests. And yet, when I changed the channel after the Chiefs won to the last game that was still going, I couldn’t help but jump for joy when the Lions pulled it out. There’s just something about this team that makes you root against them. As long as we can all come together and hate the Steelers in unity, then the world is an all right place. I don’t hate the Cowboys. I don’t not like them either. As a fan of an AFC team, I have no reason to hate them. The NFC is irrelevant to me. So I’m indifferent to them. Unless they were to beat my team, then I’d hate them for like a week or so, then move back to hating the Colts, Steelers, Broncos, Chiefs, Jets and others. I don’t hate the Cowboys, I pity them. If I had to live in Dallas I’d be bummed too. Plus, the whole Jerry Jones thing. @Dave : It sounds like you actually like the Cowboys (or a lot of their players), at least compared to our mutual NFC East rivals. It’s OK, come on over to the dark side. I like individual players just fine. The only thing more priceless to watch than Tony Romo’s face swell up with despair is when Marshawn Lynch single-handedly ripped through the Saint’s defense, then the camera cut to a look of pure horror on Drew Breeze’s (pun intended) face. I sense that you feel for Tony Romo like i feel for Patrick Willis, plays for the most sickening team but you can’t hate him, like Larry Fitzgerald.